​The Saluting Battery is located on one of the best vantage points overlooking the Grand Harbour. Its origins are as old as those of the City itself, having been built as part of it, in 1566, by the Order of St. John on the design of the military engineer Francesco Laparelli. The building of Valletta followed the end of the Great Siege of 1565. 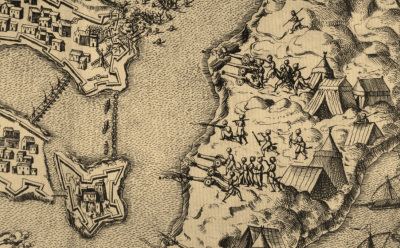 During that conflict, the full length of the Valletta promontory was easily overrun by the Ottomans who built several powerful siege batteries to keep the Knights of St. John and the Maltese holed-up within Fort St. Angelo and the walled towns of Vittoriosa and Senglea. One such battery was located on the rocky outcrop on which the present day Upper Barracca and Saluting Battery stand. Equipped with heavy bronze basilisks and directly facing Fort St. Angelo this battery mercilessly pounded the ancient fortress across the water. Following the miraculous lifting of the Siege on the 8th September 1565, the Order of St. John hurriedly rounded support from all the crowned heads of Europe and the Pope, in particular, to build a new fortified city on the same peninsula which had been occupied by the Turks, known at the time as the Sciberras Hill. In doing so, they also sought to build a powerful defensive position in place of the infamous Ottoman battery which had caused them so much worry and pain throughout the siege. This led the military engineers to devise a powerful multi-tiered artillery platform that could rake with its cannon fire the full length and depth of the Grand Harbour and also command its surrounding high grounds. A large number of heavy calibre guns were mounted here for this purpose. According to the Order’s custom, the city ramparts were divided in eight parts each of which was assigned to a given langue. In this case, the responsibility for the manning of the St. Peter and St. Paul Bastion fell on the Italian langue that was also responsible for the Order’s fleet and the artillery. Hence, it became known as the Italian Post. The Italian Post represents the left shoulder of the landward defences of Valletta. The bastion is roughly quadrilateral in shape and slopes outwards for stability. Its front and left flanks face the harbour, whilst its right flank overlooks Marsa and Floriana. The extreme-end of the right flank reforms into a projecting rounded shoulder which protects a partially covered sunken flanking battery (piazza bassa) which defended the foot of the St. Peter and St. Paul’s Curtain at the back of the bastion. This battery is entered via an underground tunnel by the gated entrance of the bastion. The right face of the bastion is flanked by Valletta’s Grand-ditch. A counter-guard was added across the ditch at a later date to strengthen the right face of this bastion. The upper part of the bastion consisted of a massive platform that could accommodate a large number of heavy cannon. Its loftiness ensured that it would enjoy an unobstructed field of fire of some 270° over the harbour and the headland beyond the fortifications of Valletta. Entrance was gained through a grand ceremonial gate from Castille Place. This and the fact that it enjoyed unrivalled vistas over the harbour may have contributed to its becoming a popular social meeting point for the Italian knights. So much so, that in the early 17th century the celebrated Italian Knight Fra Flaminio Balbiani obtained permission from the Grandmaster to erect a roofed arcaded loggia for the benefit of the knights that congregated there for games and leisure. This remained so till 1775 when on the orders of Grandmaster Ximenez the roof was dismantled, some say to discourage any plotting, from taking place there, against him. In 1824, this part of the bastion was opened as a public garden as it remains today. It also became the resting place of one of Malta’s early British governors - Thomas Maitland. Since its conversion into a public garden, numerous monuments were erected to commemorate dignitaries and important members of the community. The lower part of the bastion is where the Saluting Battery stands. This consists of an open rectangular platform surrounded by a continuous stone parapet over which guns could fire. A crenelated parapet stood along the right side of the battery but this was removed sometime in the mid-19th century. The battery has two small gun powder magazines positioned on either side of a central side-arm store, in which, artillery implements for all guns were stored. The original entrance of the battery lies to its left extremity through Battery Street. An additional stepped entry was also added in 1924 when it was linked to the upper garden. In 1824, Lt. Col. Henry Anderson-Moorshead, Chief Royal Engineer and Lt. Governor, was buried at the battery. An ornate Greek temple-like monument was built for him. From its very start, the grand location of the battery ensured that it was to be used for ceremonial artillery firings. As a result, along with its highly important defensive role the firing of gun salutes was added. Gun salutes were fired to greet dignitaries or ships visiting the island and to mark national and religious occasions. Gun salutes were also fired to announce important naval and military victories and the succession or death of a sovereign. Minute guns were also fired from this battery in the event of state funerals. After the adoption of a time ball service by the Royal Navy at Portsmouth, England in 1824, a similar service was started in Malta. This indicated the exact hour at mid-day for the benefit of ship-masters on board vessels to calibrate their ship clocks by. These time-pieces, also called maritime chronographs, were used to find the longitude at sea by comparing the difference between the time at the last harbour visited and that on board ship at that moment in time. The time ball service also employed the firing of a gun at the striking of the ball at noon which delivered a loud signal for all to hear. The noon-day gun service in Malta was provided from one of the guns at the Saluting Battery and went on, uninterrupted until November 1923 when its place was taken by the telegraphic signal sent out from the Greenwich Observatory. The use of artillery as a means of announcing public time was not new in Malta, for three gun signals had been fired from a signal gun in Valletta since its inception. This gun was first operated from on top of St. James Cavalier where the Order of St. John also had its principal signal station. From here, three rounds were fired daily at sunrise, mid-day and sunset to signal out the exact time of prayer and to regulate the pace of life. The first and last shots also indicated the opening and closing of the city gates. With the arrival of the British in 1800, these time signals were transferred to the Saluting Battery although at times they were also fired from Fort St. Angelo possibly in periods when the armament at the battery was under maintenance. Throughout its long period of use, the Saluting Battery saw the full range of the principal artillery types that chart the historic evolution of artillery. In its early days, its armament consisted of heavy bronze pieces that fired large stone spherical shot. The number of which varied from time to time. Towards the end of the Knights’ period, the Ordinance List denotes the presence of 16 x 12 pounder bronze guns along with an array of other small calibre pieces most of which still used stone shot. A large number of shot and other ammunition are also represented. During the brief French occupation of the islands (1798-1800), the armament seems to have remained unchanged. Mention is made in the orders issued by the French Commander, General Vaubois that some of these guns were to have their elevations increased in an effort to better reach the Maltese insurgent positions on the Corradino Heights; in order to lessen the impact of the nuisance they were causing to the besieged inhabitants of Valletta and Floriana. The big changes began with the arrival of the British who after surveying its armament concluded that it was too old and largely worn-out. As a result, they sought to replace it first with French captured guns and eventually with weapons of their own. In 1803, several hundred French captured guns were issued from the Royal Arsenal in Woolwich for delivery to Malta. In 1803, 2 x 24-pdr carronades and an unspecified number of 24-pdr cannon, possibly captured French examples, were added to the battery’s old armament. These remained in situ until 1825. In 1848, mention is again made of the presence of 4 x 12-pdr guns which is odd considering that in 1852 the armament is given as 10 x 24-pdr guns (main parapet), 4 x 32-pdr guns (right flank), 3 x 8-inch howitzers (left flank), 2x13-inch mortars (at the back of the parapet guns, on either side, on mortar beds) and 2 x 56 pounder carronades (located in the salient angles). A few years later, in 1864, no changes are reported and the 24-pdr guns are listed as having been increased to eleven and as serving for a saluting purpose. These were at the time positioned at the centre of the main parapet facing Fort St. Angelo. In 1886, the 8-inch howitzers were replaced with 2 x 64-pdr Rifle Muzzle Loaders also mounted on traversing carriages in the salient angles. The 32-pdrs were removed leaving just the 11 x 24-pdr saluting guns. This arrangement lasted up to the late 1890s when all armament was replaced with just 11 x 32-pdr Muzzle Loading saluting guns. Quite oddly, the new guns were mounted on truck-less timber carriages as used in the case of traversing mounts. Early in the 20th century, the battery saw its armament replaced again, this time, by 8 x 32-pdr Smooth-Bore Breech Loading guns. 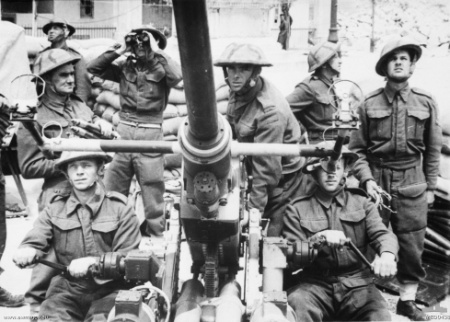 These guns were conversions of the 32-pdr SB gun of 42 cwt Monk pattern. In all, 269 guns of this nature were converted and an additional 15 specifically manufactured. This type of gun was meant as flanking armament for the protection of forts’ ditches. The 32-pdr SBBL guns went silent for the duration of the First World War as part of drive to save gun powder for the war effort. Their role was resumed with the news of the Armistice in Europe on November 11th, 1918. At 11 o’clock on that day its guns pronounced the good news to be answered back by a loud cheer of approval from the combined fleets of Britain, France and Japan fleet anchored in the harbour. 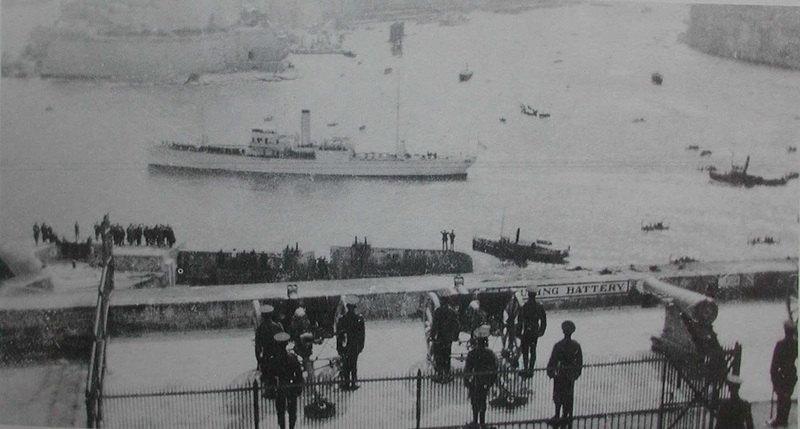 Malta’s role in the Great War was that of a massive hospital base where thousands of British and Commonwealth troops were brought for treatment away from the front, mostly from the East. Malta’s unwavering loyalty towards Britain during this conflict also earned her the right for Self-Government and the granting of a new constitution which took place in 1921. One of the first things that the new Maltese government did was to try to wrest from the military several properties which it deemed as held illegally and to the detriment of the general public. One such property was the Saluting Battery which the civil government wanted ceded by the military in an effort to extend the Upper Barracca Gardens. In 1924, the 32pdr SBBL guns were replaced by four 18pdr Quick Firing field guns except for one example that was kept as a Signal Gun. This significant reduction in the number of guns served as a handy pretext for the civilian authorities in demanding the return of the battery for public use. As expected, such claims found little sympathy with the military. It took several years for an acrimonious settlement to be reached, which in the case of the Saluting Battery, saw it being partitioned between the civil government and the military with the latter retaining the main gun platform and fencing off the guns from the public. The military also kept hold of the old gun powder stores and the side-arm store along with the old Keeper’s quarters and the side entrance. The space under the arcade was fenced off and a number of small rooms were added for military use. On their part, the civil authorities intentionally removed the whole of the gun platform with the exception of the small portion retained by the military as a good measure against any possible future military intentions. They also added a stepped entrance between the right gun powder store and the Side Arms Store which linking the battery directly with the Upper Barracca Gardens. The newly gained open space was landscaped and garden furniture added for public use. Despite all efforts by the authorities this new extension never equaled in popularity with the upper garden and was largely the domain of children intrigued by the presence of guns and military activity. With the onset of yet another world war in 1939, the saluting guns at the battery were removed for deployment along the coast against invasion. Their place was taken by a single 40mm Bofors anti-aircraft gun. This gun was installed in the right salient to form part of the anti-aircraft barrage cover over the harbour and the Dockyard. This was at first manned by elements of the Dockyard Defence Battery which formed part of the 3rd Light Anti-Aircraft Regiment of the Royal Malta Artillery. It was eventually restyled as the 11th Battery within the same regiment. During this period several small rooms were added under the arches to accommodate the gun crew. On the 24th December 1942, a stick of bombs fell on the Upper Barracca and the battery causing serious damage. A soldier was killed under falling debris but the gun remained unscathed. Following the ravages of the Blitz, the battery was patched up and restored back to its pre-war functions. Very briefly, its armament was replaced with four 25-pdr Q.F. Mk I. Alas, this was not to last for the battery was shut down in 1954, following an uninterrupted service of 398 years, with its role being transferred to Abercrombie Bastion in Fort St. Elmo, Valletta. For a number of years it lay semi-derelict until the remaining parts of the property still in military tenure were surrendered to the civil government in 1965. This opened the way for the whole of the battery to be turned into a garden. With its demise, the memory of the battery’s historic significance ebbed away quickly. This predicament was only reversed in 2004, when Fondazzjoni Wirt Artna – the Malta Heritage Trust with the financial support of the Malta Tourism Authority and the Bank of Valletta restored the Saluting Battery to its former glory. In 2011, eight new working replicas of 32-pdr Smooth-bore Breech Loading cannon were installed at this battery. This was done in order to be able to conserve the replaced guns which were in effect original early 19th century museum pieces – British 24-pdr Blomfield cannon. The new cannon were funded through a grant received from the European Regional Development Fund with part-funding from the Government of Malta. Every year, hundreds of thousands witness the daily spectacle of the Noon-day gun firing and the full-gun salutes fired at irregular intervals throughout the year. Hopefully, this effort will last as long as the rich history of this battery and that tradition will carry on being preserved for future generations as a direct result of history being brought back to life for the enjoyment of all through the daily re-enactments. 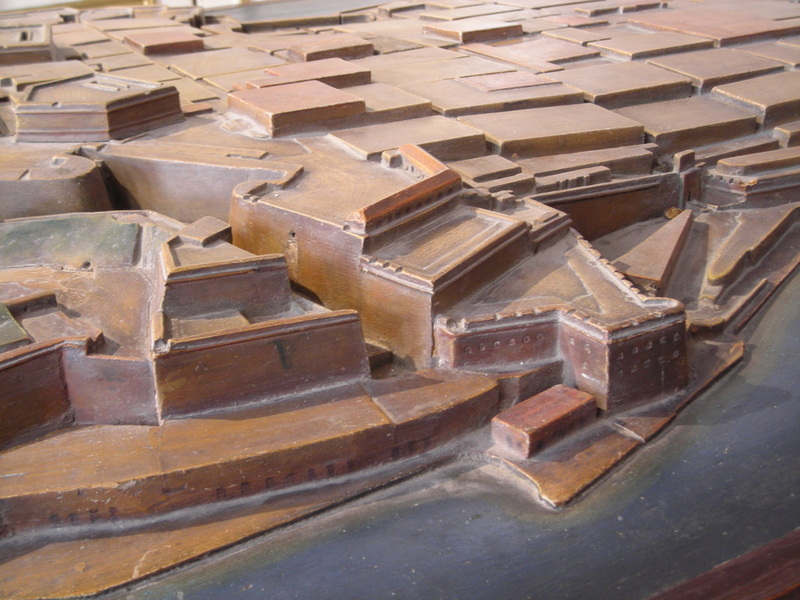 Detail from a late 19th century model of Valletta showing the stepped nature of the bastion. The Saluting Battery is the one in the middle. Minute guns fired on the occassion of the funeral of the late-Governor Congreeve in 1924. The ship featured in the photograph is the one which ferried Congreve to his sea grave in the Congreve Channel between Hagar Qim and Filfla. 40mm Bofors gun crew at the Saluting Battery sometime during the war.